When it comes to shipping art and antiques over a long distance, it is very important to ensure that every single piece is properly protected to withstand the entire transportation process. One may say that standard cardboard boxes are enough for this purpose; however, the truth is that most artworks should be transported in special custom packaging crates designed to protect delicate and fragile items in transit. The good news is that there are many packing and shipping companies in the USA and worldwide that offer art crating services for any need and budget, and Fine Art Shippers is one of them. Moreover, our art packaging and shipping service is one of the most affordable on the market, which can be easily verified if you request a free quote or simply contact our team for consultation. Fine Art Shippers has long been known for providing high-quality art crating services at very competitive prices, serving the art community in the United States and many other countries worldwide. In fact, our experienced team of crate makers builds custom packaging crates for art and antiques on a daily basis to ensure that every item is ready to withstand the rigors of the long-distance move. Besides, while most packaging crates are made in our fully equipped warehouses, we can also build them in the client’s location if necessary, provided that there is enough space for this kind of work. Each particular case is always discussed with the client individually. There are many types of packaging crates, ranging from museum-quality wooden crates to plastic crate boxes. 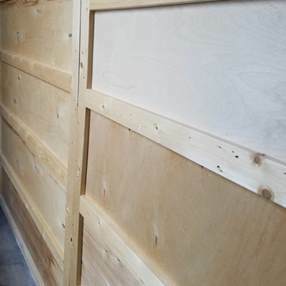 At Fine Art Shippers, we specialize in manufacturing wooden crates of all possible types, each designed specifically to the shipping requirements of the transported item. For today, we can build a wooden crate for absolutely any piece of art, be it a large painting or a metal sculpture, which makes Fine Art Shippers an all-in-one solution to any art shipping problem. It is also worth noting that whether it comes to building an open crate with wooden framework or a museum crate with custom interior, our team has experience and equipment to have this job done even within a single day, so feel free to contact us even if you have an urgent order. At Fine Art Shippers, we are always ready to help!